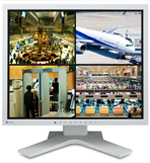 Hakusan, Japan, June 6, 2013 – EIZO Corporation (TSE: 6737) today announced the release of the DuraVision FDS1903, a 19-inch monitor designed for security and surveillance. The DuraVision FDS1903 offers a 1280 x 1024 native resolution and can be viewed from a variety of positions with a 170° viewing angle. Its maximum brightness of 350 cd/m2 combined with its contrast ratio of 1000:1 provides high visibility, even in bright environments. It also comes with a preset gamma mode that further improves visibility by adjusting the gamma depending on the type of image being displayed. In addition, for environments where the monitor must be placed above eye level, the DuraVision FDS1903 includes an “Up View” function that minimizes the washing out of colors that may occur when viewing an LCD screen from below. Both underscan and overscan display settings are included in the monitor. Underscan shows 100% of an image and is ideal for video. Overscan displays about 95% of an image, which eliminates extraneous TV broadcasting data that sometimes appears at the edges of the screen. The DuraVision FDS1903 comes with an analog D-Sub 15 pin input for connection to a computer and a composite (BNC) input for connection to video surveillance equipment such as closed-circuit televisions (CCTV) and security cameras. The composite input supports NTSC, PAL, and SECAM signals. To reduce ghosting and flicker, the composite input has a 3-dimensional Y/C separation circuit which separates the brightness signal (Y) from the color information signal (C), allowing the monitor to display high quality images with little noise. Compact dual 0.3-watt stereo speakers with RCA inputs are built in for audio capability. The stand has a 100 mm height adjustment range, 30° tilt, 70° swivel, and 90° pivot capability so that the screen can be adjusted to the ideal viewing position in any environment. A VESA-mount version (no stand) is also available for installations. The FDS1903 is built for 24-hour use and is backed by a 2-year manufacturer’s warranty for maximum reliability. Equipped with an energy-saving LED backlight. Remote control for the powering the monitor on/off, OSD navigation, volume control, toggling preset modes, and switching between input signals. Black or gray cabinet options.